Does a grammatical term such as “unclear antecedent” make your brain buzz unpleasantly? Let me help make it simpler so you can edit your own writing more effectively…. When I was in high school, I used to get back my essays filled with little red markings. These notes said things like “SP” for spelling mistakes, “run-on sentence” (although I seldom made that particular error) and “unclear antecedent” for my most common foul-up. Even that red-lettered admonishment seemed unclear to me at the time. But today, more than 40 years later, I have a much better grasp of grammar. So, let me give you some easy-to-understand instruction on how to avoid unclear antecedents. This sentence provides a classic example of an unclear antecedent because the reader can’t be certain what “it” the writer means. Is he or she referring to the folder? Or the bus? (Or, perhaps, both?) But this is a junior high example of unclear antecedents, and I mention it only to be complete. Most bloggers, academics or corporate writers are too smart to make this kind of mistake. New York City is a place people dream of visiting. Millions of people go every year to walk between the interesting shops and see the latest Broadway shows. The rate of tourism has skyrocketed for it. Because of this, the rate of tourism has skyrocketed for the Big Apple. Of course, you could also simply repeat the words “New York City,” but I always prefer to avoid repetition when possible. I never go to that shop because they have terrible customer service. I never go to that shop because it has terrible customer service. Remember, even though a shop or a corporation seems big and might hire several thousand people or encompass dozens of stores or outlets, the business itself is a singular entity. Every student must have their books. It is interesting that so many NFL players are taking a knee during the national anthem. This is the key issue that customers need to understand. Fortunately, it’s easy enough to fix these errors. How? Be more specific! The weather was hot. Or, The temperature was hot. Customers need to understand that… [describe issue here]. 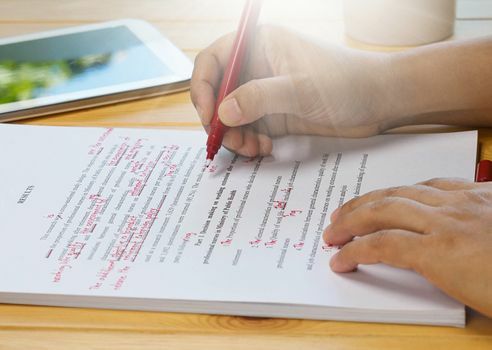 If you’ve hired a professional copy editor, your own editing efforts, beforehand, will likely save you money, because the editor won’t have to work so hard. If you haven’t, your readers will be grateful for your extra attention. My video podcast last week addressed the issue of fear of publishing. Please consider subscribing to my YouTube channel. If you have a question about writing you’d like me to address, be sure to send it to me by email, Twitter or Skype and I’ll try to answer it in the podcast. Do unclear antecedents trouble you or do you think such grammar concerns are too much fuss about nothing? We can all learn from each other so, please, share your thoughts with my readers and me in the “comments” section, below. And congratulations to “Goat Airsoft,” the winner of this month’s book prize, Becoming an Academic Writer by Patricia Goodson for a Sept. 11/17 comment on my blog. Anyone who comments on today’s post (or any others) by Oct. 31/17 will be put into a draw for a copy of On Writing Well, by William Zinsser. To leave your own comment, please, scroll down to the section, directly underneath the “related posts” links, below. Note that you don’t have to join the commenting software to post. See here to learn how to post as a guest.